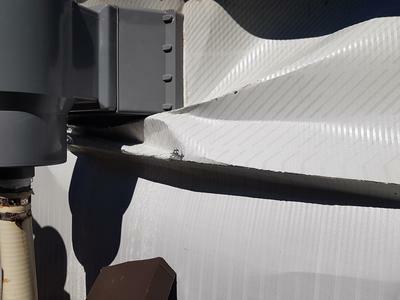 This past winter I had some ice damage to the one area of our pool that houses the skimmer, causing a tear in the wall around the skimmer, and some bending of the wall in and around that area also. The rest of the wall seems OK.
Now that it is warmer out I was considering fixing it by hammering the bent sections of the wall straight with a rubber mallet and 2x4. 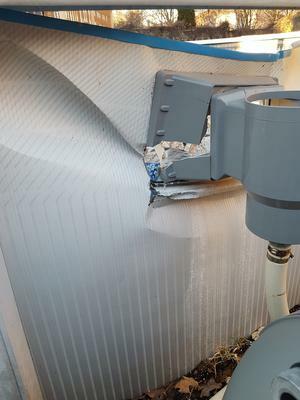 Then, remove the liner and patch over the skimmer with a 2ft by 3ft piece of sheet metal on the inside of the pool, affixing it with some kind of adhesive and duct tape, hoping to provide a bit more structural support, and also covering up the tear in the wall. Finally, I would then cut a new hole for the skimmer in another section of the wall, before installing a new liner. I was wondering if you had any advise for doing this? Does my approach sound like a good one? 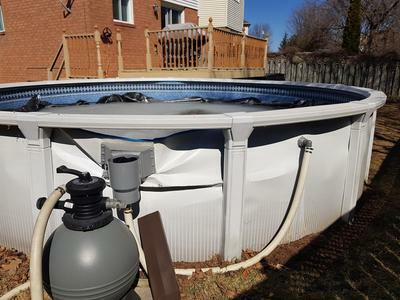 I am a bit nervous to screw up the repair, ruining the pool, so any advise you might have would be wonderful. Hi James You are spot on in your approach. 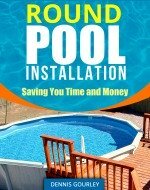 The most water pressure on a pool sidewall is on the lower half, the upper half is easy to make repairs on. You pound it flat, patch over any damaged area and if need be cut a new skimmer opening. When cutting a new skimmer opening here is my method. I take the face plate on the outside of the pool and mark the wall where the two top corner holes will be. I drill two holes and bolt the plate to the outside of the wall. I then drill two bottom corner holes and use two more bolts. I then proceed to drill all the holes. With the face plate bolted to the wall you can take a sharp razor knife and score the opening. Score it several times, as deep as possible. I then use a hole saw and drill a hole in the center of the area about 2" or so around. I can then take tin snips and make four cuts, from the center to the four corners. 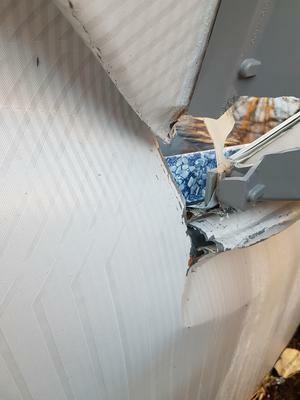 These four sections can then be bent back and forth and will snap off leaving you with a perfect skimmer cutout.